This game may sound and look familiar at first, but don't be fooled. 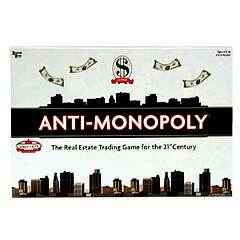 This real estate trading game presents an exciting twist where players choose free enterprise or monopoly - and play under different rules as a result. In addition, this fun and intriguing game comes to you after making its way through a fascinating, real-world legal battle. Decide for yourself: who wins? Is it the Competitor who charges fair market value for rent? Or is it the Monopolist who amasses control over whole regions and can charge much higher fees? Includes game board, game money, 3 blue monopolist pawns, 3 green competitor pawns, 25 monopolist cards, 25 competitor cards, 28 title/mortgage notes, dice, 35 houses, 15 apartments, instructions. For 2 to 6 players ages 8 and up.